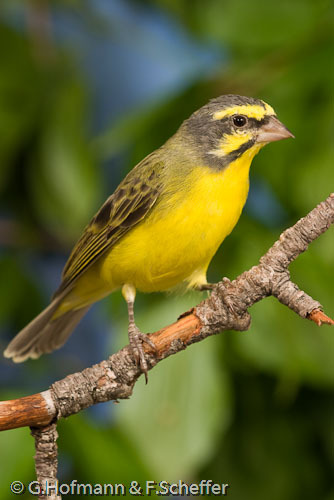 Barely 12 cm tall, bright yellow and a voice that even opera-singers can get jealous; no wonder that Yellow-fronted Canaries belong to the most popular birds among aviculturists. 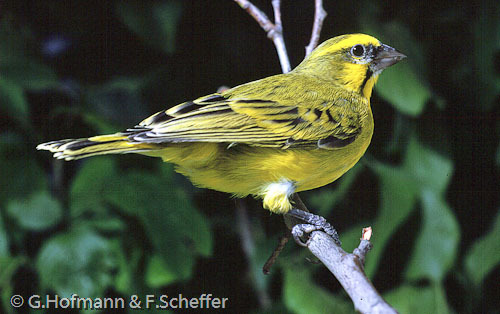 Being colorful, having a good voice and on top of it being a hardy species makes it the ideal bird for many breeders. The only reason that breeding success was pretty low in recent year was the fact that every year large numbers of this fascinating species were shipped from their origin in Africa to importers all over the world. An uncertain future for most of these little avian gems and because of the large numbers shipped every year the birds were cheap and readily available sometimes even in the smallest pet-shops. There was simply no need to breed them. Things have changed since the import-ban; nowadays a lot of breeders take care of the species and the number of birds born in captivity is increasing year by year. 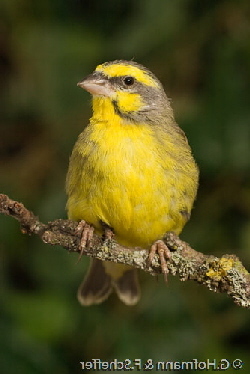 The home range of the Yellow-fronted Canary is huge. It can basically be found in all parts of Africa south of the Sahara. It avoids real desert and densely forested areas but can often be found near human settlements such as orchards, plantation or edges of fields. The nutritional requirements for the Green singers can be easily satisfied. 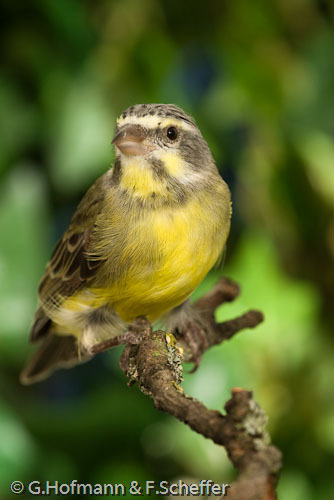 The Yellow-fronted Canary is a common, gregarious seedeater. In the wild grass-seeds are there main nutrition and insects are added for rearing the offspring. Captive birds luckily are not picky and easily accept new food or eggfood as a substitute for living insects. 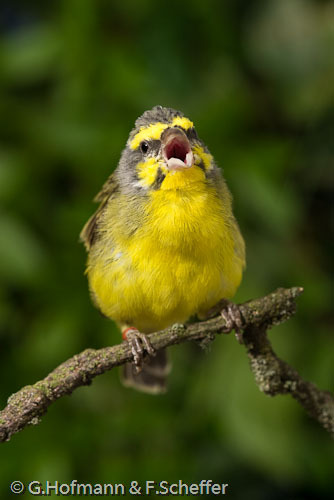 This behavior makes the bird also a suitable species for beginners. When we kept our birds in breeding cages (100 x 50 x 50cm) they got the Blattner-mixture no1 for serinus as their basic food. When they were housed together with waxbills in an aviary they got the seed-mixture for waxbills from the same company. During the breeding season we supplemented the basic mixture with germinated seeds of the waxbill mixture. The main source of protein for our birds is a commercial eggfood for finches which is mixed with frosted Pinkies and Buffalos. We would not hesitate to feed only eggfood but we use this mixture also for our waxbills so to keep things easy we offer the same for our Green singers. They highly appreciate greens, a favorite items for them are ripening seedling heads, such a chickweed or plantain or ripening grass-seeds and spray millet. They also like the sprouts and first leaves of salad. So we started to sow salad and Orchard-grass in small pots of peat. Most birds went for it right away some hesitated a little but all our birds accepted it and as most of our Green Singers like to breed in winter it is an easy way to provide fresh and healthy greens. We offer these goodies mainly during the breeding season in particular when the birds are rearing chicks. 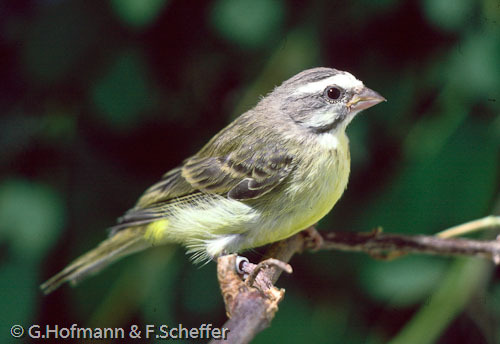 Green singers live in a highly seasonal environment which should also be considered in captive birds. When our birds finished their molt we simulate the non-breeding season with no access to highly nutritious food. Basically they only got the dry seed mixture and only very occasionally some greens. During the breeding season sprouted seeds, eggfood, greens and of course the dry seeds were offered daily. Sand, cuttle bone, and crushed oyster shell as well as a mineral block are always available for them as are crushed baked poultry eggshells and mineralized grit. To prevent egg binding, we start to dust the offered seeds with Nekton MSA one to two months before the breeding season. As most of their relatives Green singers are very active birds and if they have to be housed in cages they should be as large as possible (100 x 50 x 50 cm worked fine with our birds but they surely would have appreciated more space). The best is to house them in a well structured aviary and as they are not overly sensitive to cooler temperatures they can be very successfully housed in an outdoor-aviary. There is one big drawback when housing them outdoors, they tend to keep their endogenous rhythm for quite a long period of time and often will try to breed in the cold winter months. Not a brilliant idea in the northern hemisphere, in particular as birds originating still from Africa take quite a while until they adapt to our breeding season. When our birds didn’t start to breed by August we took them into indoors breeding cages and sure enough most of them had clutches in November. In large aviaries they show their impressive courtship-flights during the breeding season. 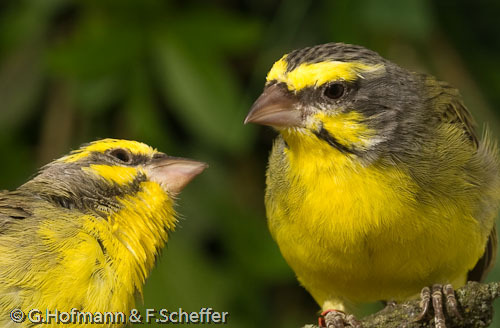 To house them together with other finches can be both tricky and easy at the same time - most of our birds were quite peaceful but some males were very aggressive and defended their territory vigorously so that we had to remove this pairs. Usually Green Singers get along with Estrildians quite well and, what is important they have roughly the same nutritional requirements. There is no way to house two breeding pairs together or keep them together with other Serinus species, serious fights would be the outcome and they can even end lethal. Outside of the breeding season aggression is low and we always keep them as a small flock but to be on the safe side we separated males and females. If the birds are kept in a well planted aviary they often build their nests in dense scrub. Our birds love cedar and arbor vitae. But all our birds also accept artificial nests. They prefer well concealed locations. So in cages we add some twigs around the canary-nest pans. Some of our pairs prefer nest-boxes for finches with an open front. As nesting material we offer various material like grass, coconut-fibres, moss, burlap, rootlets as well as fine materials like plant down for nest lining. They build their relatively small nest in just a few days. The clutch size varies normally between three and five but mostly consists of four eggs. Only the female is incubating the eggs the male’s task is to defend the nest and to feed the incubating female. If everything goes by plan the chicks hatch after 13-14 days and usually Green Singers are very diligent parents and rarely fail to rear their offspring. Our Green Singers got sprouted seeds, eggfood mixed with some frosted insects as well as half-ripe frozen millet and grass-seeds. We always pay attention to offer not too much of the eggfood/insects mixture; some pairs get in heat again, build a new nest and lay a new clutch while they abandon the offspring from the first clutch. We feed as much as necessary but not as much as possible and had quite good results using this strategy. Green Singers fledge when they are around 16-19 days old but will still be fed by their parents for another two to three weeks. Most of our breeding pairs kept in aviaries don’t get aggressive against their youngsters so we often keep them together until the end of the breeding season. Things are different with the pairs in the breeding cages. Here we had to separate the young three weeks after fledging as they tend to disturb their mother while she is already incubating the next clutch. Whether they are housed in cages or aviaries it is important to observe them carefully. Some fathers can get quite nasty against their own sons and we even had cases where we had to remove the male after the young had fledged and the female had to rear the young alone until they were weaned. Luckily molting into adult plumage doesn’t stress the young too much and we never had any casualties as it is still common among more delicate species. 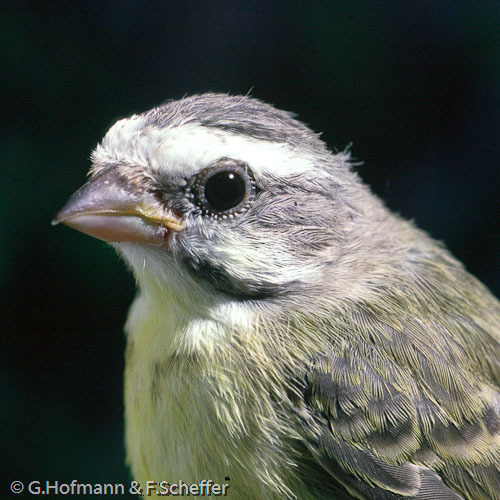 Since the Import-ban it is no longer easy to obtain this beautiful little bird, good breeding results will be necessary to establish a viable breeding population and thanks to the efforts of many breeders it looks like the Green singer will not get extinct in captivity.